Snakes are unique creatures that can be very unpredictable. Even those that own these slithering animals as pets can never guarantee how they’ll react to human touch. They’re defensive by nature and are always on the lookout for predators. Because of this, it’s important to be cautious around snakes. Whether it’s a snake out in the wild or a captive snake in a cage, it’s important to handle them with caution. The way a snake will act when being handled depends on their individual temperament and species. 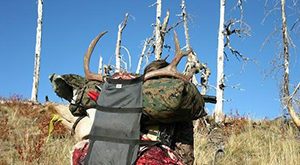 While some species are known to be calmer and less aggressive, there’s always a chance of striking. Regardless of the reasoning for capturing and handling the snake, it’s important to prepare yourself. You need to understand what to do before you approach, what tools to use, how to read body language, and how to handle specific types of snakes. Before even attempting to handle a snake, it’s important to read it’s body language. If a snake is in the defensive position, it should be avoided. Alternatively, you can use a number of tools that will protect you from bites. The most obvious sign of stress and discomfort is an “S” shape. If their body recoils into this shape, it signifies that they’re ready to strike. If that’s the case, back off or use some snake tongs. The snake should be relaxed and moving its tongue before handling it. The worse thing you can do is catch a snake off guard. Sticking your hand or tool directly over the snake’s head is the quickest way to get bit. If you’re out in the wilderness, make some noise. Ruffle the brush so that it’s aware of your presence. In the case of captive pets, tap on the glass or cage. Before proceeding, make sure that the tongue is moving. This indicates that the snake senses you and is thinking rather that acting on pure instinct alone. Once it knows you’re there, approach from the side. Avoid coming in directly above the head or at its tail. These areas are where predators will typically attack, so it will go into ambush mode. If the snake is a pet, pat the middle of the body first. Give it a moment to sense your familiar touch. 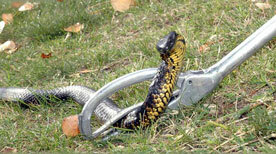 When you’re attempting to catch a wild or aggressive snake, it’s good to invest in some tools to keep you safe. To prevent bites, gloves are available. These gloves are tightly woven out of durable materials that block fangs from penetrating. If you’re outside, boots and gaiters will help avoid nasty surprises. Gaiters attach to your shins and cover the area that snakes are prone to strike. Boots use tough materials to cover vulnerable areas of your foot. Finally, tongs can help with lifting and relocation. Tongs gently grab onto the snake’s body, making it possible to lift and move the creature away into a container while keeping it at a safe distance. There are certain times when snakes are more comfortable with being handled. Typically, the best time to remove pesky snakes from the wild are during the early spring and late fall. During these times, snakes are more lethargic and less active. They will be less likely to strike, though you should still be careful. When it comes to captive snakes, they’ll go through periods of lethargy each day. It’s important to move them during this time. However, avoid moving them when they’re sleeping to prevent startling and agitating them. Snakes that have just eaten should also be avoided. They will likely still be on edge from the activity they went through attacking and eating the food. You should wait for at least 48 hours to ensure that the food has been digested. Another time to avoid handling snakes is when they’re shedding. Snakes are quite jumpy when they’re shedding due to their vulnerability. The most common type of snake held in captivity are non-venomous. While these snakes don’t contain harmful venom, they’re not always docile. They can still strike and bite. 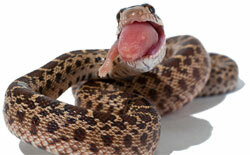 Not only that but some non-venomous snakes have toxic saliva that can pose a number of problems. 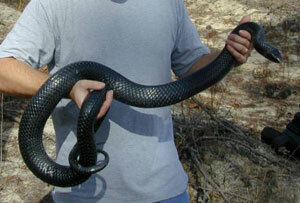 Most non-venomous snakes are small to medium sized and can be handled quite easily. 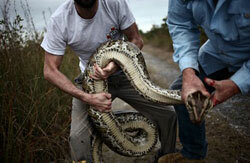 If the snake is aggressive, put on a pair of gloves and have tongs as a backup. Simply slide the hand underneath the first third of the snake’s body. Avoid the area directly behind their head. As you begin to lift the front part of the body, use the other hand to lift the lower quarter and support their weight. This should make the snake feel at ease as you move it to a waiting container. Venomous wild species like rattlesnakes are some of the most dangerous around. 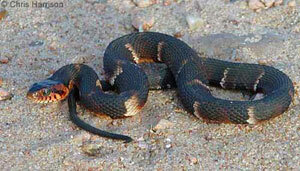 Their venom can act quickly to cause paralysis, organ failure, and even death. It’s important to be cautious when attempting to catch these snakes, as they’re unpredictable. While they aren’t inclined to bite, handling them can cause stress and agitation. Make sure to wear boots, gaits, and gloves. The actual handling process will be done with snake tongs. When you’re ready to catch the snake, use the tongues to gently grab the upper third of the body. Make sure to use a light yet firm grip. Too much pressure will cause pain and can fracture their spines. The container should already be prepared prior to grabbing the snake. Once it’s in the jaws of the tongs, quickly move the snake into the container and put the lid on. If the snake is particularly heavy, you may need a snake hook or additional tongs. As you’re lifting the front, use the supplementary tool to lift the lower third of the body in tandem. Large constrictors are generally quite calm. However, they have the capability of causing significant harm. Not only do they bite, but their powerful muscles can squeeze the body and make it difficult to breathe. Despite this, these snakes are commonly kept as pets in their earlier years. Unfortunately, many owners let them go once they get to an unmanageable size. They can reach lengths up to 15 feet long. In certain parts of the country, these snakes run rampant in the wild because of owners setting them free. Moving these gigantic snakes requires more than one person. Their weight alone makes it difficult for a single person to handle. Not only that, but these gentle snakes can become vicious creatures in a split second. Having a second person around to help in the worst case scenario is pivotal. Handling these snakes is very similar to smaller snakes. One person should grab the front third of the snake while another grabs the back quarter. Due to their nature, it’s not uncommon for constrictors to instinctively wrap themselves around whatever is handling them. If it’s a person, this can be a bit daunting. In most cases, they won’t squeeze, so let them coil for comfort. If they coil around the neck, slowly unravel their bodies. If they feel threatened and attack, start to remove the snake starting from the tail. Have your partner grab the tail firmly and unwind working towards the mouth. If they’ve bitten, dislodge the teeth gently. It goes without saying that you need to be careful around these snakes, especially when they get larger. Always approach the handling process with multiple people and keep them away from small animals and children. Proper preparation and technique can help you avoid potentially dangerous situations. Regardless of whether the snake is caught in the wild or held in captivity, these creatures are wild animals. They act on instinct and can turn at any second. With the right tools and technique, you can handle virtually any snake without any problems.